Santa’s Nicest Bonus is Here! To have a peek at your current rating from Santa Claus, all you need to do is hop on board Mr. Sloto’s sled filled with the nicest holiday celebrations! Deposit as little as $25 and you’ll have access to a bonus of up to 225% and 50 Free Spins! 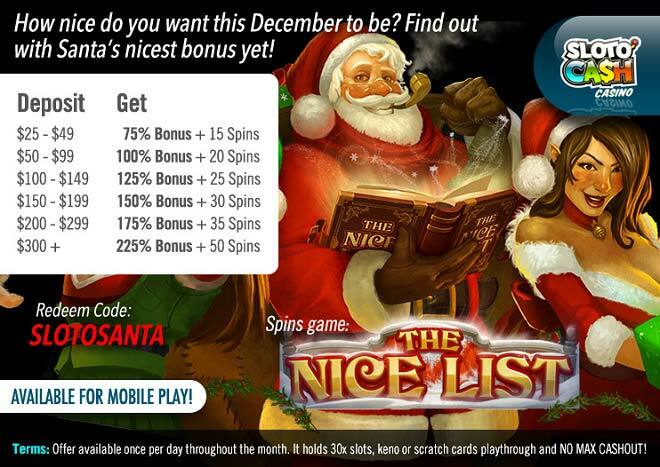 The Nice List slot will get your holiday spirit going when you land 3 or more scattered Nice List symbols to choose between the Santa Spins Feature and The Nice List Feature, both which will pay large sums of cheerful cash! This holiday season Santa will see you even when you’re sleeping – ok, maybe not that much! But he’ll surely be checking up on you on how good of a player you’ve been and reward you with a 225% Match + 50 Free Spins!